Product Features: - Capture stunning 4K video and 10MP photos in Single, Burst and Time Lapse modes. 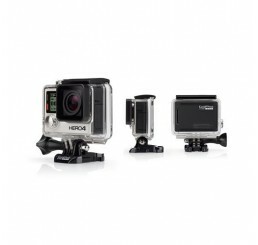 - Durable by design, HERO5 Session is rugged and waterproof to 33ft (10m) without a housing. - A single press of the shutter button powers on the camera then starts recording video or time lapse photos automatically. - Packed with all the action camera accessories that you need to catch any moment perfectly. 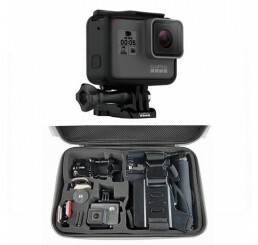 - All accessories fit into a hard shell EVA case that also fits most models of GoPro and Safari Action Cameras. - 16 piece kit - compatible with all models of GoPro, Safari and Sony action cameras. Product Features: - Capture stunning 4K video and 12MP photos in Single, Burst and Time Lapse modes. - Durable by design, HERO5 Black is rugged and waterproof to 33ft (10m) without a housing. - Enjoy the simplicity of touch. When the display is dry, you can preview your shots, change settings and edit your footage, right on your GoPro. - Packed with all the action camera accessories that you need to catch any moment perfectly. 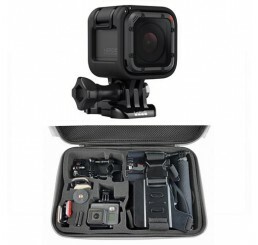 - All accessories fit into a hard shell EVA case that also fits most models of GoPro and Safari Action Cameras. - 16 piece kit - compatible with all models of GoPro, Safari and Sony action cameras. Hero4 black ships with: - Hero4 Black camera - Standard 130ft depth waterproof housing - Skeleton back door - Rechargeable battery - Curved adhesive mount - Flat adhesive mount - Quick release buckles - 3-way pivot 4K30, 2.7K50, 1080p120—HERO4 Black is the first camera of its kind to feature ultra high-resolution, high frame rate video as powerful as this. With 12MP Burst photos at a blistering 30 frames per second, HERO4 Black helps you capture the moments you don’t want to miss. New Night Photo and Night Lapse modes offer customizable exposure settings of up to 30 seconds for single and Time Lapse photos. HiLight Tag enables you to mark key moments while recording so you can quickly locate your best clips later for convenient playback, editing or sharing using the GoPro App or GoPro Studio. SuperView™, a GoPro-exclusive video mode that captures the world’s most immersive wide-angle perspective.